It was anything but what the Doctor ordered…. but at least the 10kt side-wind kept the paddlers cool as they raced from Rottnest Island direct to Sorrento (taking about 2km off the usual course). Conditions were fairly flat, although there were small bumps to work with for the elite paddlers out front. Tim Jacobs was in the front bunch from the start and made a move about 16km into the 24km race, taking a 100m lead. We had a great audience on surfski.info watching the text commentary live with nearly 1000 readers logging in. 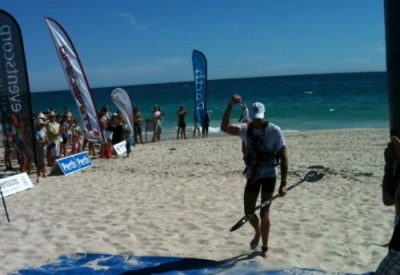 Stories, pics and video will be up on surfski.info over the next few days… make sure to check in!